The Santa Roza Business Club is a landmark feature element to the topmost floor of the building to enjoy the city panoramic views. Used up over the residential terrace, the double height Business Club offers a unique space for corporate events and entertainment. Access will be via one of the lifts serving the office floors plus the service / fire lift. A series of acoustic partitions will sub divide the space into a number of meeting venue, or the space can be opened up to a large reception / entertainment venue. A small kitchen will serve for the day to day catering however for large functions the catering will be outsourced and delivered to the club via the service lift. Like the apartments below. The business Club will enjoy 360 degree panoramic views offering a unique place for high end social and corporate venues. Above the Business Club a garden terrace extends the enclosed space below into an amazing alfresco experience while dominating Nicosia skyline. 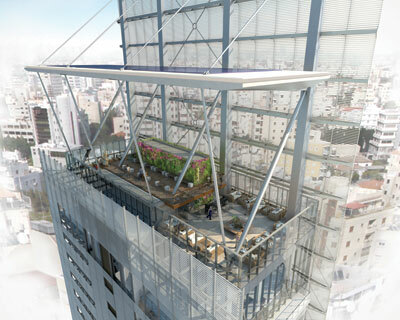 Carefully selected finishes combined with a unique sophisticated environment, the new terrace will take Nicosia urban art of living to a new level, making it one of the most desirable corporate and business destinations. To view the architectural plans of the Business Club click here.